I went to the Spidey summit in November last year. I held on to my story for over 6 months and it finally saw print yesterday. The summit was over two days and we had hours of interviews with the cast, the filmmakers, and the trainers. It was amazing. 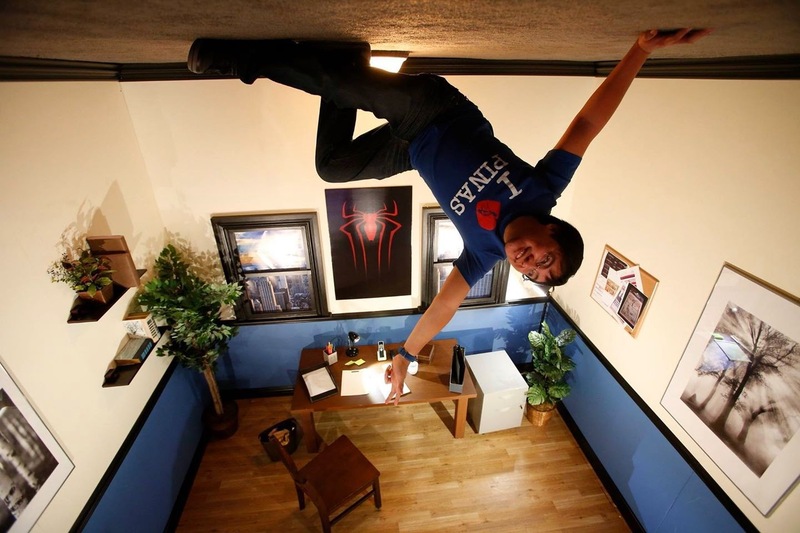 Raymond Lo as Spider-man wannabe! Lol! MANILA, Philippines - The new Spider-Man movie is now open in theaters. It is expected to shatter box-office records worldwide. This writer saw a preview back in November and I can declare that the 30-minute clip shown to us was indeed amazing! The Spider-Man summit in Los Angeles was held two weeks after the Philippines was devastated by Supertyphoon Haiyan. When Andrew Garfield learned that I was from the Philippines, he told me he was sorry for what just happened and he surprisingly requested our roundtable to offer a minute of silence for my country. He closed his eyes and I saw him whisper a prayer. “It is really crazy what’s happening there. I am thinking about you guys,” he said to me afterwards. It was a gesture that reinforced my initial impression of him: There’s a good man playing Peter Parker/Spider-Man. Like his character, Peter Parker, Andrew stated that he, too, is not immune to struggles in life and that he felt the enormous weight of his responsibility to the fans of the series when they were filming the sequel. He also said that playing the human alter ego was more challenging than being Spider-Man himself. When he touched on the purpose and destiny of every superhero, this writer immediately thought of a question that I thought was legitimate and relevant at that time. Also present at the two-day summit were Andrew’s co-stars Emma Stone, Dane DeHaan and Jamie Foxx, who played table tennis with his daughter between roundtable interviews. Director Marc Webb, who was surprised to hear me ask about his breakthrough film and one of my all-time favorites, 500 Days of Summer, during our visit to his editing room was also in attendance. Legendary comic icon Stan Lee, Oscar-winner Hans Zimmer and Grammy-winner Pharrell Williams joined the cast during the morning press conference on Day 1. Of course, Stan received the biggest applause when he was introduced. It was during the press conference when a Japanese journalist asked Andrew a rather direct question about the sequel: “Could you tell me how better this film is compared to the first one?” she asked. “How much better it is than the last one? It’s so much better than the last one,” Emma quickly volunteered the answer before Andrew could form a reply. The Amazing Spider-Man 2 is designed to be bigger, if not the biggest of all the Spider-Man movies in the past decade and Sony did a calculated move to reveal as little as possible about the movie which has millions and millions of fans worldwide clamoring for as much information they could get before the global release of this spectacular sequel. The clips shown to us at the summit were not chronological and only one villain was shown. Take that as a hint. Entertainment Weekly reported that several villains would be introduced in this sequel with some boldly predicting that the notorious Sinister Six will make an appearance — which has not been confirmed by anyone. And if one wants a direct confirmation, this writer thinks the best person to approach would be Stan, Spider-Man’s creator himself. “You know, the first thing they think about when they start a new movie, is what cameo will we give Stan?” Stan joked during the press conference.